This map was sent to me by Patsy through the Postcrossing forum. Patsy lives in Juneau, the capital, which is near the border with Canada. There are no roads into or out of Juneau, one must take a boat or plane to get to the town from outside. Alaska became a U.S. state in 1959. Originally, the United States bought the land from Russia in the 19th century. And today I also have a map of Russia to share! This card was sent by Audrey_Zoe in Russia. It is another fine addition to my growing country map collection. The first is a map, the first Mississippi map card I have for my map card collection. And the second is a card of Mississippi’s flag, which was adopted in 1894. The flag is the only U.S. flag to still include the Confederate flag’s saltire. A new flag was proposed in 2001, which would have replaced the saltire with a blue canton with 20 stars. However, a referendum to change the flag was defeated by Mississippi voters. These cards came from cognac on the Postcrossing forum this summer. Today I have a collection of art cards to share with you. First is this Postcrossing card from Germany. It shows some artwork from Sandro Botticelli, the early Renaissance painter. Second is another Postcrossing card from Germany, showing a painting by the 19th century French artist, Pierre Renoir. Renoir is one of my favorite artists. The back of the card says that the title of the work is “Schlafende” or “Sleeping” and that it was painted in 1880. Next is a card sent from a Dutch Postcrosser. The card shows a painting called “Conversations” by Nguyen Thanh Binh. This card was printed by IKEA, which has surprisingly nice postcards that don’t even require assembly. And finally, Grant Wood’s classic painting “American Gothic,” painted in 1930. This card was sent by Jennifer in Nebraska, who had visited the American Gothic House in Iowa. First is this card of the Ravenel Bridge in Charleston, South Carolina. I got this card from a Postcrossing forum swap, but I am not sure who sent it because it apparently got into the mailbox before the sender wrote anything other than “Hi Kate!” I think the sender meant to write more, but accidentally sent it too early. This second card comes from Arkansas as an official Postcrossing card. It shows the Broadway Bridge that connects Little Rock and North Little Rock. The third card comes as a swap from Jason in Canada, who recently became a follower of the blog. Hi, Jason! It shows the Capilano suspension bridge in British Columbia. The bridge is 200 feet (61 meters) above the Capilano River. The first bridge here was built in 1889 and then replaced in 1903. Today about 800,000 people visit the bridge each year. And finally, there is this Postcrossing card from Ukraine. In the background there are the Carpathian mountains. The card says that this spot is the geographical center of Europe. On the left is a 1994 stamp celebrating 100 years of the Grey Cup, the championship game of the Canadian Football League. On the right is a 1982 stamp for the International Philatelic Youth Exhibition. Another UNESCO site to check off my list: Glacier Bay, Alaska. This time, with two cards that came just a few days apart. First, this view of Glacier Bay comes from Postcrossing forum member Cognac in Florida. It shows Margerie Glacier, a 21 mile (34 km) long glacier in the bay. It was named after the French geographer Emmanuel de Margerie. This second card comes from my friend and classmate, Josh, who is in Alaska working for the summer. It’s hard to tell from the picture, but the card is covered in glitter. Wherever there is snow, there is glitter. Josh writes that he bets I didn’t know that the glaciers had been covered in glitter to “beautify” the park and attract more tourists. Many thanks to Cognac and Josh for sending these great cards! And now the third and final installment of my animal card stash clearing series. First we saw animals from Europe, then animals from Asia. Today it is time for animals from the Americas! This card shows some Florida manatees and comes from Cognac on the Postcrossing forum. This card from the Saint Louis Zoo shows parent and child giraffes. It was sent by Julie via the Postcrossing forum. The sender tried to get some of all of my favorites in the stamps: owls, elephants, cherry blossoms, and sheep! That’s all for the stash clearing animal series! Today I have three American UNESCO sites, one new to my UNESCO collection. First, the new UNESCO card! This card shows the Cahokia Mounds in Illinois. In the 11th century, Cahokia was a large city — one of the largest cities in the world. It was built and inhabited by the native peoples who were part of the Mississippian culture. The tallest mound at the site is Monk’s Mound, which is 100 feet (30 meters) high. The site was listed on the UNESCO list in 1982. The card was sent by Glisten on the Postcrossing forum. 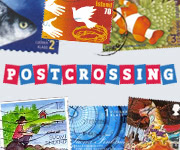 The next card comes as an official Postcrossing card. It shows the Grand Canyon in Arizona, a UNESCO site since 1979. And finally, another official Postcrossing card showing Independence Hall in Philadelphia, Pennsylvania. Independence Hall was the site where the the Declaration of Independence was signed, and where the Constitution of the United States was debated on and drafted. The Hall was also listed as a UNESCO site in 1979. 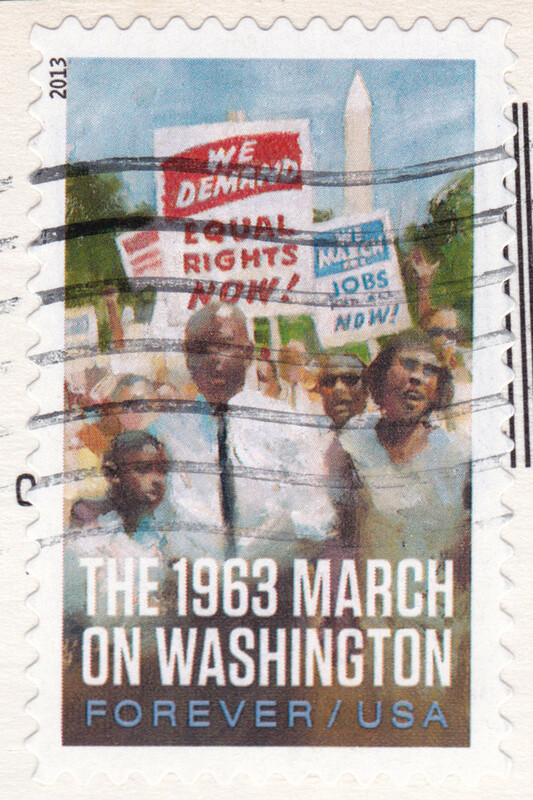 This stamp was released in 2013 to commemorate the 1963 March on Washington, an important event during the Civil Rights Movement of the 1960s. And Glisten used this new 2014 stamp depicting some stylized stars and stripes. Today I have a new state map and a new National Parks Service card, both from South Carolina! First, there is this South Carolina map from Erin on the Postcrossing forum. This is the first South Carolina map card I have received. It shows the different counties of the state, and some sand dollars. The second card shows Fort Sumter National Monument in Charlestown, South Carolina. This card comes from darkestperu, also on the Postcrossing forum. On April 12, 1861, the opening battle of the American civil war was fought here. The battle ended with the occupation of the Fort by the Confederates, who held the Fort until February 1865. South Carolina had been the first state to secede from the United States a few months prior to the battle. 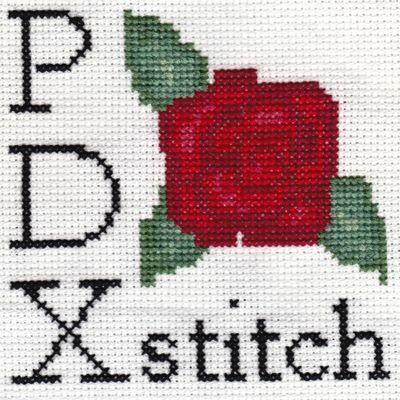 Darkestperu used one of the 33¢ apple postcard stamps from 2013. Erin used a more unusual stamp, depicting Franklin Roosevelt and Winston Churchill endorsing the Atlantic Charter. The stamp was released just 20 days before my birthdate, in 1991.